While eagerly awaiting the release of iOS 7 so I can review it and publicly discuss it I decided to see what life was like on other other side of the fence. So I have spent the last week with the Samsung Galaxy Tab 2 to see how it really stacks up against the iOS universe I have lived in for many years. First the device itself feels nice until you spend a lot of time holding it. The 16:9 aspect screen is awkward for typing and holding for long periods of time. This device is not running the latest Jelly Bean version of Android and is using the Samsung TouchWiz UI which seems to make the device harder to use than the competition. After installing quiet a few apps it seems hard to find applications easily without going into the search. The Samsung keyboard was laid out so badly I immediately had to install the generic Google Keyboard to make it useable though the reach on that wide a screen is still a little awkward. Speech recognition is fast and accurate reducing the need to use the keyboard as long as the user is in a quiet environment to use it. Samsung seems to be canabalizing their own lines and competing with themselves. When I went to purchase the unit I asked for a Galaxy Tab 2 and the salesman who worked for Samsung not Best Buy tried to steer me into the Note 2 which is apparently very close in specs to the Tab. The note got a quad core 1.4 Ghz processor vs the Tabs 2 core 1Ghz. Otherwise they have the same screen, battery, and software. The device is not running Jelly Bean at the time of this writing and according to sources Samsung will support Jelly Bean on this device but that is the end of the road. Just over one year after being released Samsung will abandon future software updates for the Galaxy Tab 2 and apparently focus on other devices like the recently announced Tab 3 and Note 2. The Play Store itself supports so many devices with different specs it is sometimes frustrating to find the right app. Users choose an app only to be told the device is incompatible with the app the user is trying to install. To date I haven't had any luck with setting up streaming to another device using DLNA or ShareAll features. This may be another limitation on TouchWiz like not supporting multiple user logins to a single device. Airplay requires no configuration and just works. Samsung will happily sell you yet another $99 puck to attach to your TV to stream content and mirror screens that only work with their tablet. Third party apps do exist that should allow the device to use Roku Mirroring or DLNA. Some apps one would think should be available on the Galaxy Tab 2 are amazingly not available. Amazon Video Streaming reports as incompatible with the Tab. 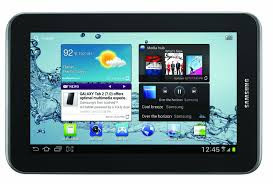 The Samsung Galaxy Tab 2 requires a lot of fiddling and customization to make it a half way comfortable product to use. The stock Android experience would be far better on this device. I believe the device is too complicated for the average non technical user if they wish to stream video to TV's or do more than surf the web and check email it seems to require a lot more effort than the iPad or even the Google Nexus Tablets. Using both my iPad and Galaxy Tab 2 together there is a lot to like about both devies. Some elements of the UI are pleasant to use while others need to be baked a little longer. Spacing of apps needs to be expanded and probably fewer per page to make apps easier to find. Most of the things I liked about The Galaxy Tab are features that are generic Jelly Bean. I enjoy using Google Now, I like the speech recognition on the device and easy of accessing Speech Recognition. I even spent a little time online with Samsung tech support to try and figure out a few of the features I couldn't get to work. Support just kept telling me the feature I wanted wasn't available on the Samsung Galaxy Tab 2. Maybe in the future the feature will become available. It seems as though Samsung is slow to update their devies and not all devices even get updates even when they are only about a year old. If you want the real Android experience users are better off sticking with other devices like the Google Nexus Tablet. The Samsung Galaxy Tab 2 is probably fun for geeks that like to fiddle with their gear but if you just want it to work reliably and not have apps maybe work and maybe not then you may be best to stick with an iPad or at least a stock Android device. For me I will be sticking with my iPad and iOS devices. I like the Google Apps on it and still get access to Google Now cards. I might take another look at the Nexus as a second tablet. But if you are not getting the pure Android experience on the tablet you are not getting the most out your tablet.